A whole foods plant based diet does not include vegetable oils, not even olive oil. “Isn’t olive oil good for you”? Is the surprised reply we get when we say “no oil, not even olive oil”. Doctors, dieticians, nutrition advisory groups and the media all promote olive oil as the good oil, the heart friendly oil, the key ingredient of the Mediterranean Diet. How could they collectively get this so wrong? The following is a summary of some of the evidence that olive oil is not a healthy addition to your diet. Olive oil is a highly processed food – it is olives stripped of their fibre, minerals and vitamins (with the exception of vitamin E). Oils have the highest energy density of any food, more than twice that of sugar (oils =9 calories/37kJ per gram; sugar =4 calories/16kJ per gram). One Australian tablespoon olive oil =160 calories/680kJ; 100ml =810 calories/3400kJ. Even the addition of small amounts of oil to food promotes weight gain and reduces nutrient intake: e.g. 100g wholemeal pasta (uncooked) = 332 calories; add 1 tablespoon olive oil: 160 + 332 = 492 calories. That’s 50% more calories for little nutritional benefit. You could have added another 48g pasta to the meal for the same number of calories. An extra 50g pasta would give you 4.9g fibre, 2mg iron, 31mg calcium, 0.7mg zinc and 42mg magnesium. The tablespoon of oil gives you none of those nutrients, so it could be said that olive oil “displaces” nutrients. See related pages: Energy Density and Nutrient Density. 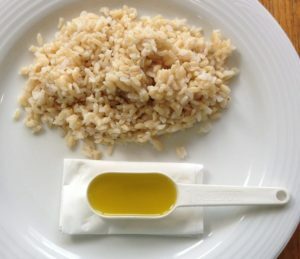 This 144g serve of cooked brown rice has the same number of calories as a 20ml tablespoon of olive oil (160 calories). A tablespoon of olive oil also has the same number of calories as a 375ml can of Coke. The term “good fats” is often applied to Olive oil. This description does not stand up to scrutiny unless you are comparing olive oil to animal fats. Olive oil consists predominantly of omega 9 monounsaturated fats which are not required by humans other than as a concentrated source of calories. It may surprise you that olive oil is moderately high in saturated fats – 15% – and therefore no amount of olive oil added to the diet will bring the proportion of saturated fats down to a target of less than 10% of calories. Olive oil contains vitamin E. In fact, many vegetable oils are high in vitamin E because it’s a fat soluble vitamin that is retained when the fats are extracted from their whole plant-food source. Vegetable oils appear high in vitamin E because they are a food concentrates – on a per calorie basis, they are no higher than the plants from which they were made. Many whole plant foods, including whole grains, are rich in vitamin E, and our digestive systems evolved the capacity to absorb this fat soluble vitamin long before the invention of salad dressing. We do not need to add oil to our meals to absorb carotenoids and other fat soluble vitamins. The textbook argument that we require added fats to absorb fat soluble vitamins comes from one study (Brown et al 2004) that was funded by a salad dressing manufacturer. They designed a salad so low in fat (and not eaten with a mixed meal) that those subjects didn’t absorb carotenoids like the subjects that ate the salad with the dressing. Just to put it into context, 2.4 g fat can be provided by the whole grains alone in a meal of rice and vegetables, or oats and fruit. Polyphenols are anti-oxidant phytochemicals with health supporting effects which include protection against heart disease. Extra-virgin olive oil (EVOO) is promoted as healthy because it contains polyphenols. Most of the olive oil used in cooking is not polyphenol rich EVOO and there are many whole plant foods that have a much higher polyphenol content than EVOO. This table shows the polyphenol content of popular plant foods, and also shows the content per 100 calories. 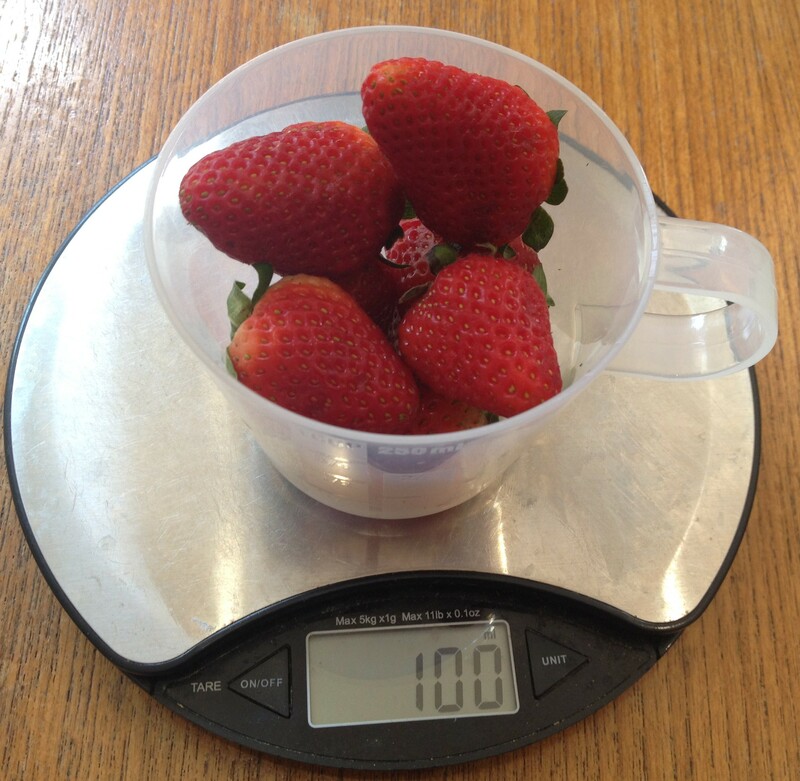 Compare eating 100g strawberries (235mg polyphenols; 26 calories) with a 20ml tablespoon EVOO (12mg polyphenols; 160 calories). Observations of the people of Crete post World War II found a low incidence of heart disease. The people there were physically active and their diet consisted of grains, fruits, vegetables and legumes and small amounts of olive oil, wine and fish. Not exactly the Australian version of the Mediterranean diet. Fifty years later a follow up study found that those individuals who consumed the most olive oil had the most heart disease (see Vrentzos et al. 2007). A similar positive association between olive oil and heart disease has been found in Greece. This is the study that really launched “The Mediterranean diet”, and by proxy, olive oil, as heart healthy. The study group were instructed to make healthier food choices, including eating more vegetables. The vegetable oils used were not exclusively olive oil but included omega-3 enriched canola oil. The study is widely seen as ‘proof’ that a Mediterranean diet with olive oil is more heart healthy than a low fat diet. However the “low fat diet” group were really a control group on a high (37%) fat diet and there was not a statistically significant reduction in heart events – although there was a small reduction in strokes in both the added nuts and added olive oil intervention groups. It cannot be determined whether the olive oil or the nuts produced these health benefits as these groups also received dietary coaching and consumed more legumes, vegetables and fruits – factors which are known to reduce cardiovascular risk. The olive oil group were provided with a weekly supply of polyphenol rich olive oil, not the ordinary stuff that most people buy in the supermarket. The data collected in this study has resulted in over 100 published research articles and whenever we read “Mediterranean diet is better than a low fat diet” it’s usually based on PREDIMED. Olive oil and polyunsaturated oils raise HDL cholesterol, however changing the value of a biomarker for disease does not always translate into reduced disease risk. Dr Lawrence Rudel (Rudel et al 1995) compared the effects of saturated fat vs olive oil on African Green Monkeys (which have similar fat metabolism to humans). The monkeys eating olive oil had higher HDL and lower LDL than those eating saturated fat. But at the end of five years both groups had exactly the same amount of coronary artery disease. It is interesting to note that drugs that artificially raise HDL have also failed to protect against heart disease. Dr Robert Vogel published a study (Vogel et al 2000) on the effect of vegetable oils on the arterial flow. Olive oil reduced arterial blood flow by 31% and canola oil by 10%. It is thought that olive oil blocks the production of nitric oxide by the endothelium. Nitric oxide dilates arteries. This suggests that olive oil impairs the capacity of endothelial cells to produce the vasodilator, nitric oxide. High fat meals, both saturated and unsaturated fats, result in many hours of lipaemia, blood that is so laden in fat that serum appears opaque and milky. Under these conditions the red blood cells clump together and the blood flow through the smallest capillaries slows or stops. The potential for thrombosis increases due to activation of clotting factor VII. The Australian Dietary Guidelines do not support the high intake of olive oil that many of our health professionals are advocating. The guidelines recommend that we choose foods from the five food groups, none of which include olive oil. Vegetable oils are listed outside of the core food groups with a note to “use in small amounts”. The guidelines recommend that Australians “limit” their consumption of high saturated fat foods rather than just replace them with other fats. Tips to eat less saturated fat include “don’t deep fry foods” and “use small amounts of unsaturated oils if needed”. The guidelines recognise the role of energy dense foods in promoting weight gain: “Foods with a higher energy density encourage energy intake above requirements” – and recommend that Australians limit the consumption of “energy-dense, nutrient-poor discretionary foods”. Oils are the most energy dense foods, they contain minimal nutrients and are discretionary in that they do not belong to any of the five food groups. No Oil — Not Even Olive Oil! – (4 min video) Dr Caldwell Esselstyn Jr, is adamant that we should use “no oil” and gives his reasons in this excerpt of a longer talk. Oil to Nuts: The Truth About Fats – (6 min. video) Jeff Novick, RD. A humorous look at the nutritional qualities of olive oil. Lithander, F. E. et al. (2013). Postprandial effect of dietary fat quantity and quality on arterial stiffness and wave reflection: a randomised controlled trial. Nutrition Journal, 12(1), 93. Perez-Jimenez, J., Neveu, V., Vos, F., & Scalbert, A. (2010). Identification of the 100 richest dietary sources of polyphenols: an application of the Phenol-Explorer database. European Journal of Clinical Nutrition, 64 Suppl 3, S112-120. Ribaya-Mercado, J. D., Maramag, C. C., Tengco, L. W., Dolnikowski, G. G., Blumberg, J. B., & Solon, F. S. (2007). Carotene-rich plant foods ingested with minimal dietary fat enhance the total-body vitamin A pool size in Filipino schoolchildren as assessed by stable-isotope-dilution methodology. American Journal of Clinical Nutrition, 85(4), 1041-1049. Rudel, L. L., Parks, J. S., & Sawyer, J. K. (1995). Compared with dietary monounsaturated and saturated fat, polyunsaturated fat protects African green monkeys from coronary artery atherosclerosis. Arteriosclerosis, Thrombosis, and Vascular Biology, 15(12), 2101-2110. Rueda-Clausen, C. F., et al. (2007). Olive, soybean and palm oils intake have a similar acute detrimental effect over the endothelial function in healthy young subjects. Nutrition, Metabolism & Cardiovascular Diseases, 17(1), 50-57. Vrentzos, G. E., Papadakis, J. A., et al. (2007). Diet, serum homocysteine levels and ischaemic heart disease in a Mediterranean population. British Journal of Nutrition, 91(06), 1013. Does a Mediterranean Diet Really Beat Low-Fat for Heart Health? – Dean Ornish, MD reviews the key publication of the PREDIMED study. How to Cook Indian Food without Oil – By Vegan Richa. NB We just add ground spices to the pan after cooking the onion (which has had a small amount of broth added). The spices may temporarily stick to the pan, at which time we add some more broth and stir it in quickly.